The m/s Paul Gauguin was designed specifically to sail the shallow seas of Tahiti, French Polynesia and the South Pacific, visiting small ports that larger ships can't reach and effortlessly blending into the stunning natural beauty of the South Seas. 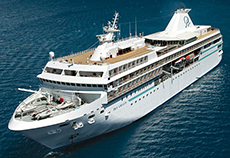 During your time aboard the m/s Paul Gauguin, take advantage of our extensive selection of facilities and services. With a variety of luxurious amenities and unique activities, your days aboard ship are sure to match the splendor of your stunning French Polynesian surroundings. For the ultimate in relaxation and rejuvenation, discover our luxury spa. Then explore the ocean's surface via kayak or windsurfer from our onboard watersports marina, or experience Tahiti's underwater wonders with our optional SCUBA certification program the only one of its kind on French Polynesian luxury cruises. Or experience the natural and cultural history of Tahiti through a lecture with one of our onboard naturalists. Enjoy your meals at your leisure at one of three stellar, onboard restaurants, and spend your evenings relaxing and enjoying entertainment at our Casino and Piano Bar, La Palette Lounge, or the Grand Salon. Whether you choose to indulge your body, mind, or spirit, you're sure to find an activity to match your passion on the m/s Paul Gauguin.